Our Customized Game Felts are a really nice touch! Whatever you want, we can do it! So you don’t want your table to have the “off the rack” look. No problem! 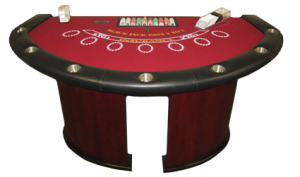 We specialize in printing custom casino table felts and can assist you in creating the table felt you’re looking for! Our felts are printed on state of the art printing equipment, high definition, dye sublimation suitable for long term professional use. We offer our custom printing services to established casinos, casino night companies, custom game developers, and gambling enthusiasts all over the country. Our print process starts with the initial design. We can print from virtually any file type, but remember – the better the artwork, the better the final printed layout. Vector files (EPS, AI, or PDF) are preferred, since they can be scaled and adjusted without losing any quality. If you’re not able to provide vector artwork, designs should be at least 150 DPI, when printed at full size (i.e. – 300 DPI at half size or 600 DPI at quarter size). We’ll be happy to take a look at your artwork before getting started and can discuss any quality issues to be sure you get the best possible print. If your order requires any artwork assistance from us, we provide custom design work starting at $75.00. Our professional felts are printed on 100% polyester gaming suede, developed specifically for the casino industry. It offers a soft nap and comfortable playing surface designed to provide long lasting durability. These high quality felts are water and stain resistant as well as fire retardant. If you need any assistance with your custom game layout order, give us a call and speak with one of our design specialists at 317-857-0168. Call Now to create a Customized Game Felt for your next event at 317-857-0168.